The Milwaukee Astronomical Society (MAS) dates back to 1932. Our membership is comprised of individuals of various backgrounds, ages, education, and occupations. What we all have in common is astronomy and our love of it, from beginners to advanced amateurs, from casual observing to scientific research, and everything between. T he society possesses one of the largest and finest amateur club observatories in the world, featuring 9 observatory buildings, almost entirely financed, built, and maintained by our members. All of these facilities are available to our members! And what do we do? We do every aspect of astronomy from solar, lunar, planetary, comets, meteors, variable stars, double stars, nova, supernova, deep sky objects such as nebulas and galaxies, and many more. There is a whole universe of objects to view, image, share, and help to understand. We view the universe. With our eyes, our binoculars, and our telescopes. From our nearby moon to quasars 9 billion light years away. Have you seen the moon, Jupiter, or Saturn through a telescope? You should! We image the universe. 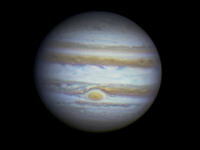 Our members use digital cameras and CCD equipment to take incredible photos of all types of celestial objects. Look at the photos here and in our Showcase and you see results which only a few decades ago could only be achieved by professionals using the world’s largest instruments. We share the universe. Not just with our members, but also with the public, especially on our observatory open house nights. And with special events when there are eclipses, transits, and comets. We help to understand the universe. The club actively promotes scientific contributions such as variable star observing, eclipsing binaries, RR Lyraes, and occultations. We write scientific papers for publication and have given many presentations. And by doing so our members have won many prestigious astronomy awards, and the International Astronomy Union have named two asteroids after our members! And all of these things we do have one important thing in common: we do them because they are fun! They have to be because astronomy for us is a hobby. But it is a hobby we are passionate about. We hope you can see that by the information here on our website. However, there is nothing better than experiencing our club in person. The MAS generally meets on the third Friday of every month from September to May with the exception of December. Presentations by club members and by professional astronomers are the focus of these meetings. The schedule for the membership meeting can change so check this site, or a copy of the latest Focal Point newsletter for times and locations. We currently have about 175 memberships. The MAS board meets once a month to conduct society business on a schedule that is flexible. Refer to this site for specific meeting schedule. A key benefit of MAS membership is the Saturday key holder night. Every Saturday night a member possessing their own key to the observatory has the responsibility to open it up to the non-key-holding membership for their use. The MAS library can be accessed at this time as well. We encourage MAS members to expand their horizons and share what they have learned. 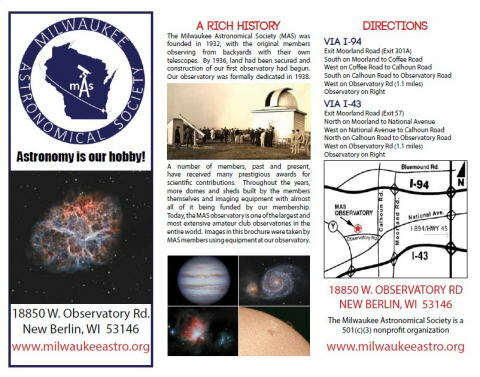 The Milwaukee Astronomical Society is a 501(c)(3) non-profit organization.